By default, PROC UNIVARIATE produces traditional graphics output, and the basic appearance of the histogram is determined by the prevailing ODS style. The NOPRINT option suppresses the display of summary statistics. 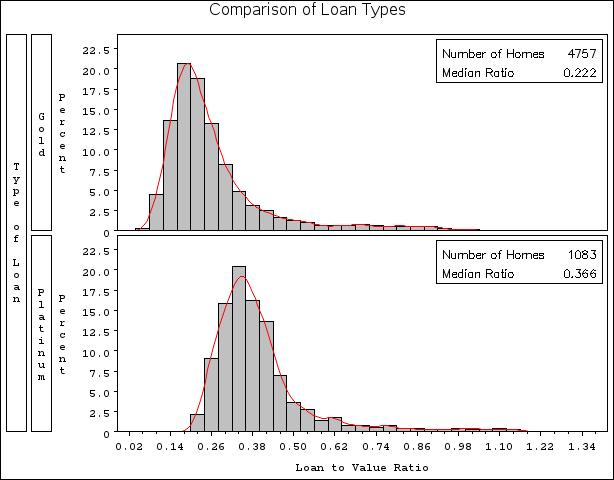 The INSET statement inserts the total number of analyzed home loans in the upper right (northeast) corner of the plot. 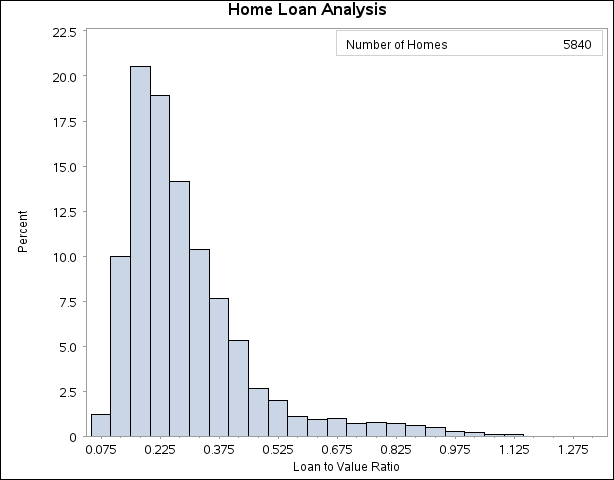 The ODS SELECT statement restricts the default output to the tables of quantiles and the graph produced by the HISTOGRAM statement, which is identified by the value specified by the NAME= option. The CLASS statement specifies LoanType as a classification variable for the quantile computations and comparative histogram. The KERNEL option adds a smooth nonparametric estimate of the ratio density to each histogram. The INSET statement specifies summary statistics to be displayed directly in the graph. The NOGSTYLE system option specifies that the ODS style not influence the appearance of the histogram. Instead, the CFILL= option determines the color of the histogram bars and the COLOR= option specifies the color of the kernel density curve.